It’s taken a lot longer than anybody thought it might, but they’re back. The interactive county formation maps at The Newberry Library in Chicago have finally come back online. Because maps like these are a simply indispensable part of genealogical research. 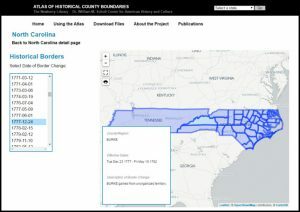 When you have families, like mine, that migrated during the early days of the Revolutionary War to Rowan County, North Carolina, and then lived in Burke County, Yancey County and Mitchell County — but never moved after arriving in North Carolina — you really need an interactive way of viewing the boundary changes that impacted your families. That’s what the historical county boundaries map database at the Newberry Library has always been. Now it’s spring again… and the maps are back. Now there are some things about the new system that I’d like to see changed. I’d love to see the titles of the jurisdictions (counties and districts) appear on the map as I zoom in — and wouldn’t it be nice to have that as something we could turn on and off as we need it? — and I’m not fond of the fact that the information box describing each jurisdiction as you mouse over it overlaps the map unless you have it open full screen. And oh, by the way… it might be nice to just say thank you, Newberry. It’s awfully nice to have the interactive maps back. Glad the maps are back, but having trouble getting accustomed to using the site. I have the book for Mississippi and these on-line maps do not measure up! I suppose it is better than nothing. If you have issues with the maps, please email the Newberry at the link on each map page. They make it clear this is a test site and improvements can be made. One of these days you and I are going to figure out exactly how we’re related. That DNA is just too strong. Wonderful news indeed! Those maps are treasures. I’ll go over there later this week to check out those challenging ancestors who kept going west from the east coast, looking for land/opportunities. I’ve always loved the Newberry maps – have already thanked them for their work on getting them back up. Don’t forget you can get a PDF version of these maps or a Google version that works with Google Earth or Google Maps. It can be found on the bottom of the page with the interactive map launch.